Looking for an easy way to keep your little ones occupied while you slave away in the kitchen. Get a few easy art projects ready so they can have a little fun while you are prepping for the big meal. 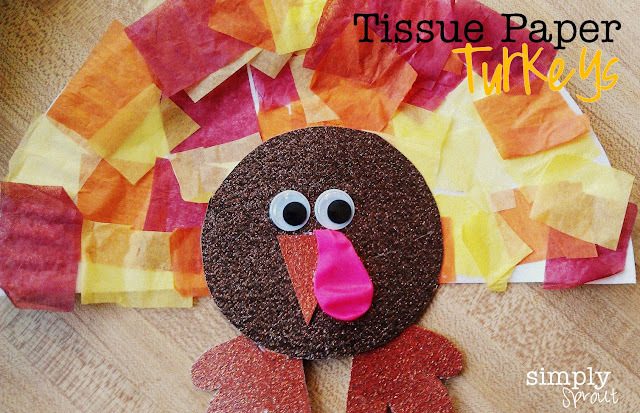 Cut a paper plate in half and then cut red, orange and yellow tissue paper into small squares. Have your little one cut out shapes that you have traced a circle for the body a triangle for the beak and 2 feet. If hey aren't ready to cut on their own just have these shapes pre-cut for them to glue together. I love using the google eyed stickers, easy for little hands to put together. We cut a slit in our brown circle and used a tiny water balloon (deflated) to add a little waddle to our turkey. Let them use some of that left over dough from your pumpkin pie to roll out and make their own shapes. Be sure to check out our Pinterest site for more Thanksgiving ideas! Wow! I have nominated you also!!!!!!! Oh yes, and I am your newest follower! Thank you all! We appreciate your vote of confidence in our blog. We can't wait to check your sites out as well. Thank you again!